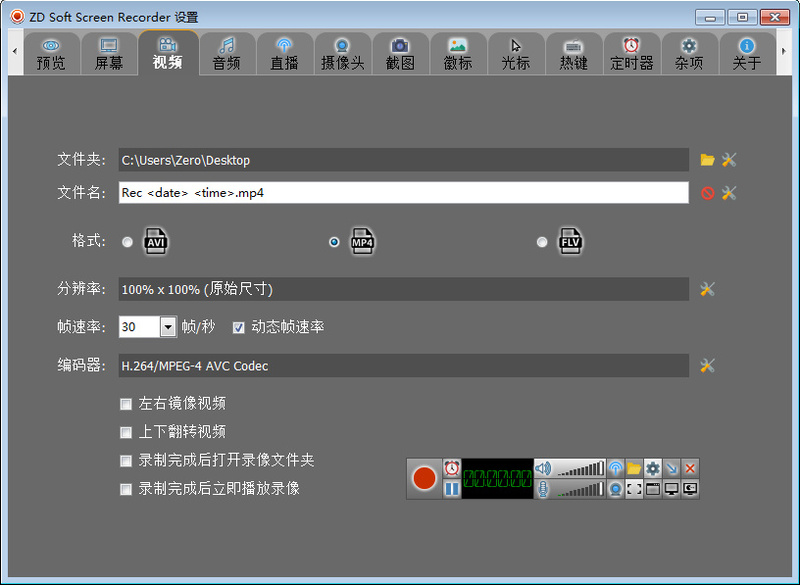 ZD Soft Screen Recorder 小巧强大的屏幕视频录制软件！优秀的屏幕录制工具！它可以录制电脑屏幕（摄像头、桌面全屏、指定区域、窗口等），实时同步音频（LAME 编码），供演示或讲解之用。便携版由NoCmd发布! • Added Italian language translation. • New mouse cursor click sound effect. • Improved the MP4 video format to support very long duration recording up to 100 hours. • Fixed a bug that the local broadcasting firewall notice still pops up when the option is disabled. • Emergency bugfix that recent changes on MP4 video format make it incompatible with some versions of Windows Media Player. • Improved program stability of long duration recording for longer than 48 hours.